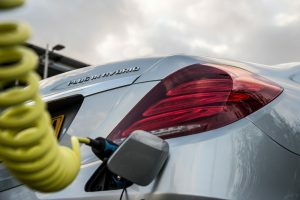 Mercedes-Benz will launch its first diesel plug-in hybrid next year, likely to be a derivative of the facelifted C-Class, with UK head of fleet, Rob East, stressing that diesel still has a place in the UK market. Using a diesel engine could solve the off-battery economy issues of most PHEVs. Although East wouldn’t confirm which car would get the drivetrain first, the launch coincides with the C-Class reaching an age typical for a mid-life refresh. Diesel plug-in hybrid drivetrains will then be rolled out to others in the range, sold alongside petrol plug-in hybrids which suit a “different user profile”, he said. The C-Class is already the UK’s second biggest-selling ultra-low emission vehicle, according to Department for Transport figures. Last year, the petrol plug-in hybrid C 350 e outsold the diesel hybrid C 300 h – which can’t be plugged in – more than three to one, also outpacing the Nissan LEAF. A diesel plug-in hybrid C-Class would be likely to use the new 2.0-litre four-cylinder engine from the new E 220 d, paired with an electric motor and newer battery technology from the updated S-Class. This could offer an electric range of 30 miles – a 50% increase on the current C 350 e, though the petrol version would also be due for a higher-capacity battery.